On June 25th 2006, we departed Mooloolaba bound for the Whitsunday Islands and the Great Barrier Reef, a trip of about 400 nautical miles. We made the entire trip north in day trips anchoring each night. Our first day out took us about 75 miles to Fraser Island where we spent several days exploring Garry's Anchorage and the Kingfisher resort. 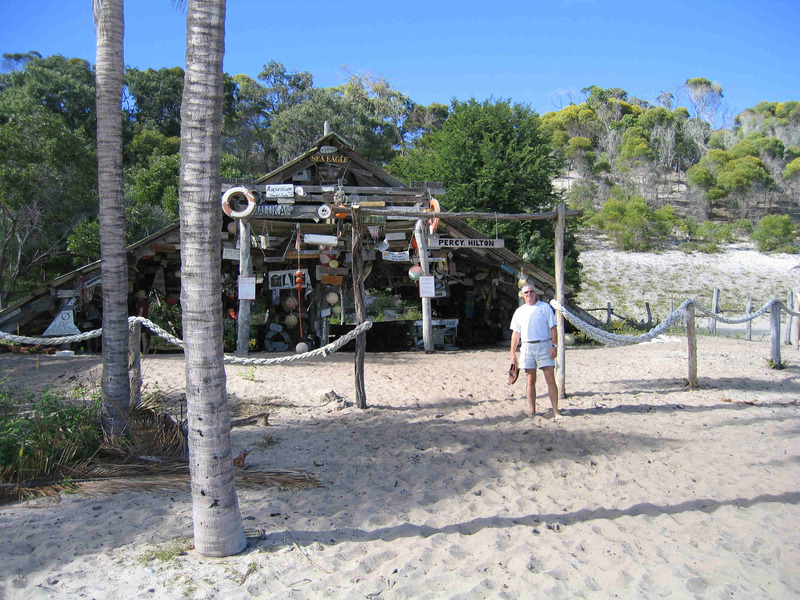 From Fraser Island, we sailed to Bundaberg where we pulled into the marina for a few days. However, those few days turned into ten days. Our second day there, we heard John & Pennie, two Americans we had met in 2004, were having trouble aboard their Beneteau First 47, Dreamcatcher. They were on their return trip to the States. They had left Australia a few days before and began to take on water as they approached Chesterfield Reef near New Caledonia. So, they decided to turn around and bring Dreamcatcher back to Australia to find the cause of the problem and effect repairs. They decided to sail into Bundaberg since it had a well marked entrance at night and they were familiar with the port. It was also the easiest port to reach without having to find a passage through the Great Barrier Reef. After hearing they were coming to Bundaberg, where we happened to be, we made radio contact with them and asked if there was anything we could do to help. They asked us to make arrangements for them with the marina to locate a berth that was near the boat lift. And, to contact Customs & Immigration to arrange for their entry back into Australia. We got everything ready for them, but, when they were just 130 miles away, the problem began to get much worse. John had been manually pumping water out of the boat for the past 24 hours and was getting very tired. He finally had to put out a "mayday" call on July 4, 2006. We acted as radio relay for the Rescue Center in Canberra which was having trouble hearing them. The Rescue Center in Canberra called two nearby ships, the container ship Chang Yun He and the tanker Global Trader and arranged for them to rendevous with Dreamcatcher. Both headed straight for her position and arrived on the scene within just a few hours. They helped by providing a lee for Dreamcatcher. In other words, they positioned their long hull between the incoming seas and swell and Dreamcatcher's position. That helped mitigate some of the surf and wave action that was buffeting the boat. A third boat also responded, the commercial fishing vessel Diamax. It was farther away, but, was hoping to salvage Dreamcatcher for John & Pennie. The Rescue Center sent a rescue helicopter from Townsville and instructed John & Pennie to deploy their life raft. It was far less dangerous for the helicopter to try to pick them up out of the life raft and away from Dreamcatcher's tall mast and rigging. However, the distance traveled by the helicopter put it pretty low on fuel by the time they arrived on the scene. With Dreamcatcher sinking, John & Pennie were lifted into the helicopter with nothing but the clothes on their backs. Their grab bag, with essential papers, money, credit cards, passports, valuables, etc., had to be left behind because of the low fuel situation on the chopper. They were flown to Lady Elliott Island, about 75 miles away, were the helicopter was refueled. From here, they were flown to the police station at Gladstone. We received a call from Customs that evening and were asked to come to the Gladstone Police Station to vouch for John & Pennie as they had no papers and no money to re-enter the country. We picked them up that evening and brought them back to Final Straw where they recovered for the next two days. We made arrangements with the Australian authorities and the American consulate to allow them to stay in Australia. And, we gave them some clothing, food and a place to sleep while they started putting their lives back together. Then, we found the current location of Diamax, the fishing vessel trying to salvage Dreamcatcher. They were in Mooloolaba and had picked up John & Pennie's grab bag and life raft with many of their valuables, including passports, money and credit cards. The Diamax's captain, Bernie, told us when he arrived on the scene they had only an hour or so of light left and the boat was too far gone for them to save. But, he did see a hole the size of a fifty cent piece at the port bow near the anchor locker. It was undoubtedly the cause of the problem. Bernie said there was no way you would see that hole from Dreamcatcher's deck. John was very relieved to know he did everything possible to save his boat and there was, in fact, nothing anyone could have done without outside help. Friends of theirs from Brisbane met us in Mooloolaba and then took them to their home to stay until they could make arrangements to fly back to the States. They're now in Washington looking for that next boat! So, with all that excitement behind us, we departed Bundaberg and headed for Pancake Creek and then Great Keppel Island. We anchored for a night at Svendsen's Beach at Great Keppel Island and then heard a weather report for a strong wind warning which would arrive in a few days. We spent some time exploring the island before deciding to sail the short distance to the mainland. We docked at the Keppel Bay Marina near the beach town of Yeppoon to wait out the coming high wind warning. While we were in the marina, the Australian Army exercised their prerogative to close a large area of superb anchorages just north of where we were currently sitting. They had a joint military exercise with the Singaporian Army and gave very short notice for this closing which was to last for ten days. So, it was now a matter of us waiting until they were finished or doing an overnight passage well offshore around the area. We decided to wait so we could experience some of these nice anchorages. We decided to take a train back south to retrieve our car. That gave us transportation while we enjoyed a respite in this beautiful area around Yeppoon and Rockhampton. Just before the Northern anchorages were reopened by the military, we decided to go back to Great Keppel and see more of it. The main anchorage there often gets a roll from the ocean swell which makes its way around the tip of the island. To help mitigate some of the roll, we put our flopper stopper out. This is a device we hang off the spinnaker pole through a block. As the boat tries to rock, the flopper stopper pulls against the boat's movement and dampens the roll somewhat like a natural stabilizer. This helps to keep the boat steady and more comfortable while sleeping at night. After leaving Great Keppel on July 27th, we arrived at Pearl Bay, one of the anchorages closed by the military. We stayed there for a couple of days. It was a pretty spot, very rustic and uninhabited. We noticed several of the boats in the anchorage with us had a fair amount of roll from the swell that came around the edge of the bay. But, we were lucky and picked a spot close to an outcropping of rocks that protected us from the swell that was getting to them. So, when everyone else was rocking, we once again stayed pretty steady and comfortable. Our next anchorage was just a few miles north, at a place called Island Head Creek. This was a very protected fjord that offered several nice spots for anchoring. Some areas were pretty shallow. The tide swings of several feet didn't help and you needed to be careful where you anchored. It was necessary to take into account these tide swings. If you didn't, you could easily find yourself aground in the middle of the night. 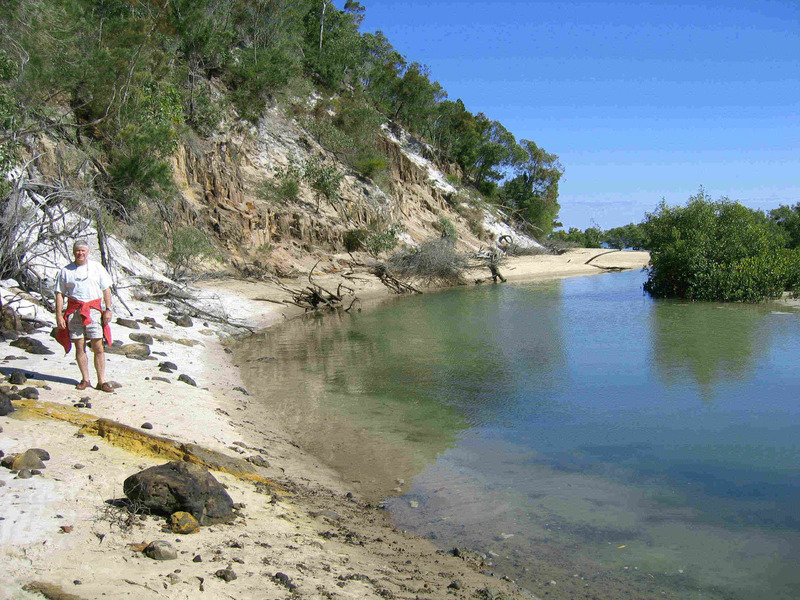 Like Pearl Bay, Island Head Creek is part of the military's Shoalwater Bay Reserve. We kept thinking how lucky these guys were to be able to practice military maneuvers in such a beautiful setting. We're told in 2007, US and Australian forces will be doing a large joint exercise and the area will, once again, be closed. So, we're glad we took the time to see it. It was very comfortable here. The area is so protected from the sea that its like being on a lake. In the morning, we woke up to low hanging clouds and ground fog. It made for a very nice view. But, we still had about 150 nautical miles to go to get to the cruising grounds of the Whitsundays and the ten day military delay had put us a bit behind our very flexible schedule. So, we set sail and headed north. From Island Head Creek, we sailed much of the day and arrived in the afternoon at Middle Percy Island, renowned for its beautiful sandy beach anchorage at West Bay. Here there's a spot where yachties have left mementos of their visit over many years. There's also some nice hiking trails over the hills to some of the other bays and anchorages. This was a neat spot and we stayed here for three days. Our friends, John & Ariana aboard By Chance from Victoria, BC, Canada were about to catch up with us. They had been on a fast track north, so, we decided to wait until their arrival at Middle Percy. The water was exceptionally clear and the weather was perfect. We were having a very pleasant stay. They arrived on August 1st. On August 2nd, we left and sailed to the marina at Mackay to fuel and provision. At this point, we were now just about 20 miles from the start of the Whitsunday Islands and the Great Barrier Reef World Heritage Area! There are four more sections about our trip north to the Whitsunday's. By clicking on the next link, you will follow the natural progression. However, if you desire, you may also skip ahead by following one of the links below the first one. To go to the next section, "Sailing to the Whitsunday Islands", click here. To skip ahead to the section, "Cruising the Whitsunday Islands", click here. To skip ahead to the section, "A Special Anniversary in the Whitsunday Islands", click here. And, to skip to the section, "Birthday Bash at Hamilton Island", click here.